The most important game in the last round took place in Blida between second ranked NAH Dey (11-2) and ninth ranked USMB (6-7) on Saturday night. NAH Dey was defeated by USMB in a tough game on the road 72-76. USMB moved-up to seventh place, which they share with Olympi Miliana and US Setif. NAH Dey at the other side keeps the second position with two games lost. D1 top team - WO Boufarik (12-0) had no problems winning another game. This time they crushed sixth ranked USM Alger (6-6) 74-55. Undefeated WO Boufarik have an impressive ten-game winning streak. They maintain first position with 12-0 record. USM Alger lost fourth consecutive game. They keep the sixth place with six games lost. An interesting game took place in where higher ranked USS (6-7) was upset on the court of eleventh ranked OS Arreridj (5-6) 77-64 on Saturday. It ended at the same time the two-game winning streak of USS. OS Arreridj moved-up to tenth place. Loser USS keeps the seventh position with seven games lost. They share it with Olympi Miliana and USM Blida. 10th ranked El Eulma (4-7) was outscored at home by fourth ranked GS Petroliers (9-2) with the biggest margin this round 110-68. 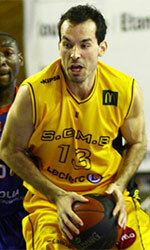 GS Petroliers have an impressive nine-game winning streak. Defending champion maintains fourth position with 9-2 record. El Eulma at the other side dropped to the twelfth place with seven games lost. There were no shocking results in the other games in round 12: Rouiba CB lost to IRB Arreridj on the opponent's court 56-64. Bottom-ranked Olympi Batna was outscored by CRB Dar El-B. in a home game 60-82. Staoueli managed to beat Ouargla on the road 73-59. Olympi Miliana defeated AB Skikda on its own court 66-62. Very expected game in B.B. Arreridj where 13th ranked Rouiba CB (3-9) was defeated by third ranked IRB Arreridj (10-3) 64-56. IRB Arreridj maintains third position with 10-3 record having just one point less than leader WO Boufarik. Newly promoted Rouiba CB keeps the thirteenth place with nine games lost. D1 top team - WO Boufarik (12-0) had no problems winning another game. This time they crushed sixth ranked USM Alger (6-6) 74-55. WO Boufarik have an impressive ten-game winning streak. They maintain first position with 12-0 record. USM Alger lost fourth consecutive game. They keep the sixth place with six games lost. Rather predictable result when twelfth ranked CRB Dar El-B. (5-7) smashed on the road bottom-ranked Olympi Batna (2-11) 82-60. CRB Dar El-B. moved-up to eleventh place. Olympi Batna at the other side stay at the bottom position with 11 games lost. Not a big story in a game when 14th ranked Ouargla (2-8) was defeated at home by fifth ranked Staoueli (9-3) 73-59. Staoueli have an impressive six-game winning streak. They maintain fifth position with 9-3 record. Ouargla lost fifth consecutive game. They keep the fourteenth place with eight games lost. Everything went according to plan when eighth ranked Olympi Miliana (6-7) beat at home 15th ranked AB Skikda (2-10) 66-62. However just four-point win is not that big difference and the fans of host team counted on more convincing victory. Olympi Miliana moved-up to seventh place, which they share with US Setif and USM Blida. Newly promoted AB Skikda keeps the fifteenth position with ten games lost.